October is National Bullying Prevention Month, time dedicated to teachers, students, and martial arts schools to work together to end bullying. Kids who bully use power to harm or control others. Power can come in the form of physical strength, access to embarrassing information. Bullying behavior happens more than once, or has the potential to repeat. Therefore, learning martial arts may seem like an obvious way to ensure your kids don’t become victims of physical bullying. As a result, they receive the self-defense training they need to protect themselves and fight back. In addition, martial arts also equips our kids with another important tool for preventing bullying: Confidence. 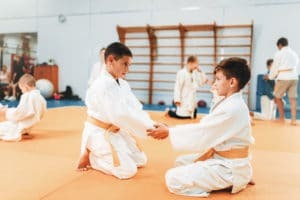 Students develop healthy self-esteem when they learn martial arts, which gives them confidence to stand up for themselves, without using force. In summary, they learn self-control, how to be assertive, think on their feet when being picked on. When a student keeps their composure and doesn’t engage, a bully loses their power. There’s one more characteristic martial arts teach that’s important to stopping bullying: Respect. Students learn to respect others and themselves. This means they’re less likely to tolerate being bullied or to bully others. In summary, organizations like STOMPOutBullying.org are raising awareness of National Bullying Prevention Month by hosting events throughout October. Martial Arts business owners and instructors can get their martial arts school involved and help put an end to bullying.